October | 2017 | Back Off, Bacteria! Our special thanks to business experts PwC for perspective in this article. You’ve got the best people with the best skills for the best salary deals ever – yet productivity continues to perform worse than you expect. You’ve called in the top consultants, put in the latest technology, deployed every efficiency trick in the book – and still, like most businesses in the country, your productivity is always dragging it’s heels. Frankly, and in practical terms, your team should perform better – but don’t. That’s right, it’s a people thing. And improving your people productivity means that you and your people work harder, better and faster. Which suggests maybe you should forget all the theory and focus on them. They are, after all, your main asset, without whom productivity would be zero. Start with them and everything should click into place. Like, how are they doing? And not as production units, but as people? How do they feel about what they’re doing, the people around them, the environment in which they’re working? And how do you show them that you give a damn? According to business gurus PwC, 83% of workers feel that their wellbeing influences productivity. OK, so you took that on board when you hired them. Which is why the swish offices, the stylish décor, the extensive wellbeing package – fitness programmes, diet counselling, medical consultancy, the works. And they give it back to you in spades. Always at their desks, never a day off, midnight oil junkies – and weekends too – they just love the place and live on its adrenalin. All well and good, but human bodies don’t function like that. And not because the spirit is willing, but the flesh is weak. Actually, that flesh is an amazing miracle. Putting up with the all-hours workload, the lack of sleep and intermittent meals. And a whole lot more that you can’t see. Like stress – not from burnout, but from depression. Financial worry for instance, is the largest single cause of stress in the UK, which in turn is the largest cause of absenteeism. The house, the car, the daughter’s special care treatment – or worse, the gambling debts, the divorce settlement, or the shares that went belly-up. Relationships too, are a major unhappy trigger – especially work-related. Maybe even caused by you. Like, how good a boss are you actually? At handling people and making them feel wanted? Do you give them space and recognition, putting them at their ease? Worse, what about the boo-boos? The ones guaranteed to make people cringe – or burst into tears when no-one’s looking? The feeling you don’t trust them, don’t want to give direction, vent your frustrations on them, break promises, fail to support them or take all the credit for yourself. OK, so you get tough with yourself and fix all that. So why is productivity still down through the floorboards? Go back to the same question you asked the team before – how are they feeling? And not how hyped up they are – how are they doing physically? Your own body can give you an answer. Because like all of us, you have something going on every 3 days or so that make you feel less than perfect. Septic cuts, cramps, upset stomachs, headaches. And we haven’t even got to the running cold yet. Or the flu, raging vomit sessions and diarrhoea, the laboured breathing, the chest pains that make you panic and head for A&E, or the dread when the Doc tells you you’ve got e.coli. That’s right, illness caused by germs. Which because your team are all fired up and enthusiastic, they try to take in their stride. Except how well can you work when your head’s like boiled knitting and even opening your mouth to talk is an effort? It’s the unwell-at-work syndrome and we all have it. Trying to be heroes when our insides are like custard. Forcing the issue, though we know we’re not up to it. How much worse can things be? Presenteeism it’s called – and on average, it hits each of us 57.5 days a year, almost three working months. And there’s your productivity gap, right there. Everybody might work for a full 12 months. But effectively, they’re only capable for 9. Which is why presenteeism costs 10 times more than absenteeism – itself costed by PwC at £29 billion back in 2012, so way more than that now. As you can calculate here. If germs are the cause – then get rid of them, and you’re away. Which is where the amazingness of the human body comes in. Because we’re constantly surrounded by billions and billions of germs. Our own bodies are even 50% bacteria – a benign partnership that looks after digestion, creates proteins, manages our immune systems, and thousands of others. But get germs in the wrong place and we’re in big trouble. This year’s A (H3N2) Aussie flu virus for instance has already killed 73 and hospitalised 133,000. And how prone we are to infections caused by germs – living 90% of our time indoors the way we do? Working together, sharing the same space, breathing the same air, touching the same things? With germs coming at us non-stop, every single second? Until we say, enough, that’s it – and get rid of them all. Easily done by sterilising our workplace so there’s no germs at at. No viruses, no bacteria, no fungi, no nothing. All press-button easy with ionised hydrogen peroxide mist – gone in 60 minutes. And of course with no germs, there’s no reason to be unwell. Plus you’ve solved the worry problems – which means, for the first time, your team can function at a full 100%. 12 months instead of 9 – how’s that for productivity? Productivity’s catch 22: what sort of wellness programme does NOT prevent germs? What catch 22? Wellness programmes work, right? Big companies point to them as big success. Team members who’ve quit smoking, inactive ones taking more exercise, high blood pressure down, social and mental health on the up, big savings on health care costs. Nice to have if you can afford it – either directly or through insurance plans. A whole basket of feelgood grabbers for your team – everything from premium discounts to cash rewards, gym memberships, and other incentives. All of them basically geared to promote team health and fitness – typically to stop smoking, manage diabetes, lose weight, or check for problems through health screenings. And that’s on top of ergonomic work stations, pleasing colour schemes, beneficial lighting and feng shui décor. Anything and everything, as this gung ho wellness guide shows. Not generally on the radar – unless you count company flu jabs. Yeah OK, protect staff – an afterthought jab of corporate conscience. What’s really in play is enhancing performance – healthier team members mean greater work capacity, more bang for the buck, better productivity. More output, efficiency – faster, faster! Yep, you got that right – it’s all about money. And because business is always about money, that’s the language decision-makers best understand. Which is how they understand wellness programmes. Golden handcuffs for top-performing staff – carrots to work harder. A glittering El Dorado to stop trained team members taking a walk down the road to the competition. Germs don’t come into it, despite exposure in the workplace to billions and billions of them every day. Every moment we breath, move, touch something or swallow we’re exposed to more. And the only protection on offer? A flu jab – with already iffy effectiveness against this year’s strain of Aussie A (H3N2) virus. Yet right in many workplaces, waiting to pounce, is another far more lethal health threat most decision-takers know nothing about. Even though every business manager is personally responsible for seeing teams are properly protected. And is liable to a £5,000 fine, a further company fine, and possibly a custodial sentence for 18 months if they’re not. Legionella is a pneumonia-related bacterium that breeds in water systems. Still-standing water, like in office air-con cooling systems, or the showerheads in the washroom. It spreads by air, so you breathe it in. And it’s so deadly, the Health & Safety people throw the book at you if it’s discovered on your watch. A £1 million fine for JTF Wholesale after two men died. £1.8 million for G4S Cash Solutions – for putting over 200 people at risk and dragging their heels for 3 years over fixing it. Fail to protect staff and it’s big stick time. But to keep things on a business footing, preventing team illnesses is also big carrot time. Not so much catch 22 – more like common sense. What does it cost in gym membership, medical check ups, keep fit classes, stop smoking clinics and fresh fruit in reception to have an impressive-looking wellness package on place? As much as 25% of your salary bill? Because that’s how much is lost every year from team members under-performing at their desks. And that’s on top of the 6 days absenteeism most businesses have for every staff member – at an average £522 per head. You read that right, under-performing at their desks. And that’s the catch 22. It’s called presenteeism and we all do it – drag ourselves into work when we’re not feeling well. And kidding ourselves we’re up to the job, even though the room’s going round, figures look all blurry and a pounding head makes any communication impossible. 57.5 days a year we’re like that – every one of us. Almost three working months. That’s not continuous time either. It’s all in fits and starts, something throwing us off our game roughly every 3 days. A day out of it, another day bouncing back – then starting all over again. Three working months plus. Which means, do the math. Right now you’re paying everyone 12 months salary, but they’re only giving you 9 months worth of value. The rest is fumbling around, going through the motions and quite possibly counter-productive. But take away THE CAUSE of being unwell and you up productivity by one third – from the 9 months you get now, plus a reclaimed 3 months – bringing you back to a full 12 month year. OK, it’s not all caused by germs. People have long-standing conditions, disabilities, physical injuries and musculoskeletal pain. They’re also stressed. Worried about relationships, finances and job security. All three of which can be job related, MAKING them depressed and prone to illness. Or in turn, being the driving motive to come to work, even though they’re so unwell they feel like death. A catch 22 of their own. Which makes the major chunk of everything germs. Exposure to germs in the workplace – where lots of people work closely together, sharing the same space, touching the same things, breathing the same air. Infecting themselves and contagious to each other – all stirred around by highly efficient HVAC systems. Sloppy hygiene doesn’t help. Because we can’t see germs, we don’t see there’s a problem. 95% of people don’t even wash their hands properly. 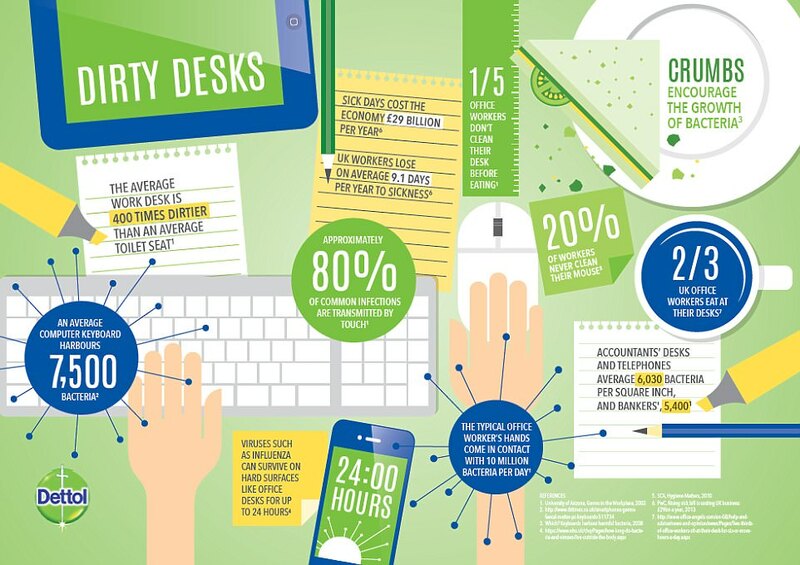 The average desk has over 10 million unseen bacteria – 400 times more than a toilet. A typical keyboard may have 7,500 organisms hiding on it. Only one in five of us ever cleans our desk before eating. At least two in three of us always eat lunch there. But take away the germs, and all these issues go away too. A REAL wellness programme that PREVENTS GERMS – with a boost to productivity that makes others look like chicken feed. And it’s so easily done. Antibacterial wipes or gel on every desk to reduce the personal risk. And a nightly sterilising regime on top of the regular cleaning schedule. Quick and simple like misting the place up with germ-killing hydrogen peroxide. ALL germs eliminated to a 6-log Sterility Assurance Level, safe every morning when staff come in fresh. Forget the golden handcuffs, this way everybody wins. It’s not rocket science either. Simply a wellness programme that keeps people well. No catch 22 about it. And isn’t that wellness programmes are supposed to be? Antibiotics crisis is an understatement – it’s an all-out world-wide calamity. “One of the most dangerous global crises facing the modern world today,” says Professor Paul Cosford, medical director at Public Health England. But he’s not telling us why. Antibiotic resistance is the impending threat he refers to – and he’s not wrong. Ramping up fast is the failure of ALL antibiotics to halt infections caused by bacteria – and with it, the complete collapse of modern medicine. According to England’s Chief Medical Officer, Professor Dame Sally Davies, without antibiotics minor infections become deadly – while surgery, chemotherapy and caesareans simply become too dangerous. It’s a little late to be surprised. Since antibiotics were first discovered by Alexander Fleming in 1928, we’ve known that sooner or later bacteria would develop immunity. Bacteria are the world’s hardiest survivors – and imagining that we would be safe from them with antibiotics was always going to be wishful thinking. Over billions of years, bacteria have learnt to survive freezing, boiling, living without oxygen or water, in acid or alkaline environments, in light or pitch darkness. What makes us think we can succeed where the elements haven’t? Tetracycline introduced 1950, resistance identified 1959. Erythromycin introduced 1953, resistance identified 1968. Methicillin introduced 1960, resistance identified 1962. Gentamycin introduced 1967, resistance identified 1979. Vancomycin introduced 1972, resistance identified 1988. Ceftazidime introduced 1985, resistance identified 1987. Levofloxacin introduced 1996, resistance identified THE SAME YEAR. Ceftaroline introduced 2010, resistance identified 2011. Which is why medics are jumping up and down about overuse accelerating this resistance – putting the brakes on the public demanding our Twenty-First Century miracle cure. Because as many as 25% of all antibiotic prescriptions are totally unnecessary. But that’s not the real problem, or even the beginning of it. It’s antibiotics’ amazing side effect we’re turning our backs on. And already it makes the whole resistance issue look like a sideshow. Ever since antibiotics started being used, researchers noted their extraordinary ability to promote growth. Bodies grew quicker, bulked up heavier, super-developing in months instead of years. They didn’t need a full strength dose either – the kind to clobber an infection. A little and often was enough, a regular under-dose to start the growth spurt and keep it going. Don’t believe it? Then ask yourself what’s the real reason two thirds of us are overweight or obese – and a third of our kids too? Animals get antibiotics, we eat them, we bulk up same as they do. Today 280,000 TONNES of antibiotics are pumped into farming animals around the world. Supposedly restricted to comply with overuse regulations. But actually a necessity to sustain the explosion of world human population. From 2½ billion in the 1950s when antibiotics began to be used in any volume, to the 7½ billion we are today. Essential to produce the the 19 billion chickens, 1.4 billion cattle, 1 billion pigs and 1 billion sheep that currently feed us. And right there is the Catch 22. Modern factory farm methods are so concentrated and so intense that animals literally live on top of each other. Crowded, living in each other’s filth, conditions are so unhygienic that antibiotics really are essential for survival. On top of the growth boosting function they’re already administered for. Antibiotics are starting to fail for farm animals too. They HAVE to be used to keep up numbers, but fight a losing battle against increasing antimicrobial resistance. Which means it’s going to happen. One day soon, animals will start to die. Penned into slum-like conditions with no protection, an epidemic that will sweep through them like wildfire. Containing it will be impossible, because there’ll be no defence. The antibiotics won’t work, so things can only go one way. Which means wholesale animal deaths worldwide. And the end of the food supply that sustains the extra 5 billion people that we have become since antibiotics enabled such huge production capability. Two thirds of the world population. Because we’re too stupid to realise that defence against them is a moving target, that they will always evolve to find a way round. And that by the time we wake up to that fact, we’ll be dead. Antibiotics crisis is right. And that’s what Public Health England aren’t telling us. It really could be the end of the world. Hot on the heels of our previous blog, here’s another stab at why you’re not getting your money’s worth in the productivity stakes. So far we’ve looked at absenteeism and presenteeism, both major productivity issues that chomp through as much as 25% of your all-up salary bill. It’s not money you see on any balance sheet because it’s already committed. You pay full-whack 12-month salaries, end of story. Though you’re only getting 9 months’ worth of value. Thanks to germs taking the edge off performance, even super-stars wind up delivering more like beginners. A big ouch that you don’t feel because you’ve already paid the money. And if all your hot-shot top performers are visibly at their desks, it’s kind of unthinkable that they wouldn’t ever perform at less than their full capabilities. All you know is, it costs an arm and a leg to get things done. Efficiency is not what it should be, so you start looking at ways to jump-start it. So sure, you look at performance. Not because it’s under-powered from health issues, but because you want to boost it and make it more than it is. Instead of putting the brakes on to STOP illnesses, you’re pedal to the metal trying to ACCELERATE your talent into going faster. Which is where wellness programmes come it. You care for your team, right? So a wellness programme is your way of showing it. Like promoting fitness and healthy living. Which has you looking at sponsored gym membership, sessions with dieticians, even medical advice on living healthy. In other words, dangling a big carrot. You want the team to go the extra mile, here’s a bribe. Yes, staff might feel more motivated and inspired to do more. Is that over and above what they’re doing already, or compensating for not reaching objectives already in place? Sure, gym membership is a nice-to-have, but it’s not essential for business, is it? Fit in body, fit in mind is a principle that does work. But if you’re looking for extra, doesn’t that point to a system inadequacy that it’s at all necessary? Instead of asking for extra effort, maybe you should be appointing extra staff. Because if the team can’t get through the wortkload in the time you’ve budgeted, there’s something wrong with your planning. They’re not machines, after all. They need their rest and leisure time. They need to recharge and revitalise with life outside work. Advance their relationships and feed the spirit that drives them both through life and for you. Which suggests any kind of wellness package might be more luxury than necessity. You’ve managed without it before now. If you can afford it, go for it. Just don’t expect a visible and measurable contribution to productivity, feelgood does not always equate into loyalty. You wouldn’t be alone with such doubts. There’s plenty of businesses out there beginning to wonder if wellness programmes are all they’re cracked up to be. More healthy, or less ill? It’s a trade-off. So if productivity is still a worry, maybe you should invest in something closer to team needs. As much as a third of absenteeism and presenteeism causes are down to emotional and mental pressures. Stress, finding the strength to cope. Allowed to fester, stress very quickly snowballs into physical issues – and productivity seriously takes a jolt. Headaches, the shakes, upset tummies, ulcers – all the things that worry and depression can cause to drag down being able to work properly. Expose any of these conditions to germs and they can only get worse. Double trouble when you could perhaps have stepped in and eased everything away. Not an area where British managers have a shining track record. Because it involves time, the ability to listen – and yes, sometimes money. Professional team members rarely show what they’re feeling – precisely why they’re professional. People seldom know of the mother dying of cancer, the bullied daughter, the financial worries with the house, or just the confidence challenges of holding down a high-powered job. Worry keeping them awake at night, self-doubt, broken-hearted despair – they’re all things that directly impact job performance, pulling down productivity. And a lot of the time, all they need is a sympathetic ear, time-off snatches to deal with outside situations, a shoulder to lean on and some encouraging words. A lot less expensive than a high-powered wellness programme. But a better way of demonstrating that you care, that you’re on their side and really have their interests at heart. Much more getting your money’s worth. Because now when the extra mile is crucial to sudden opportunities, you know you can count on them. You’ve invested in their person, not their physical condition – and the dividends will last a lifetime. Makes sense when you think about it. Because it’s not the quantity of work that boosts productivity, it’s the quality. And how much better can quality be when a team member is fully motivated and going for it? Inspired because they want to be, stimulated by work, enjoying every second – so it isn’t really a job, it’s a way of life? You want your money’s worth, you need to give of yourself. Just as your team are giving themselves to you. Get this right and you should see productivity rocket. Always a worry isn’t it? You think you’re getting your money’s worth – but there are doubts. Why does everything have to be so difficult? Why does it take so long? Doesn’t anyone care what they’re doing? And you can’t blame your team, or even think of it. You hired them. They’re all professionals. Carefully motivated and they love working for you. So is it Murphy’s Law that so many things go pear-shaped? Don’t beat yourself up about it. You’re a victim of presenteeism. Team members coming to work unwell. A lot of businesses – mainly old school – reckon that’s a good thing. Everybody at their desks, you’re up to full strength. Optimum efficiency. Because just think about the implications of being unwell at work. You’ve been there yourself, so you know what it’s like. How do you cope? The short answer is, you don’t. Yes, you can tough it out and put in the hours. But the lousy way you feel means the spark isn’t there. It might be the most involving and satisfying job in the world – but you haven’t got the sharp edge. Performance is down and you know it. You might be the most brilliant MBA ever hired, but right now you’d struggle through Key Stage One SATS. Which is what being unwell does. The sweats, the swimmy head, the roiling guts, the wanting to throw up all the time. It might be flu, food poisoning, meningitis, or whatever. Basically you’ve been exposed to germs – and your productivity is down the tubes. All very commendable, coming in to work, from a commitment point of view. The martyr fighting off demons, defiantly standing by your post. Until you consider the cost. You’re an MBA, right? Or some equally commendable professional. With a salary north of £50K. An imbursement spread over 12 months a year and probably worth every penny. But right now you don’t have MBA capabilities, do you? Or anywhere close. You’re closer to flying your desk as a Key Stage One SATS, and not a very happy one at that. Which means how good is the work you’re doing? How accurate? How professional? Without meaning to, you could be doing a lot of damage. And because you’re a trusted high-level performer, any glitches you cause might not be picked up for months. That’s not doing the business any favours – or yourself, come to that. You should be resting up, at home in bed, or in hospital. Somewhere safe where you can shake it off and avoid infecting any of your colleagues. But sure, you’ve already used up your leave allocation – so here you are, hanging in there and pretending everything is normal. And right there is why presenteeism is such a major liability – 10 times the cost of absenteeism , if not more. And according to at least one business study, most of us are like that 57.5 days a year – almost 3 working months. Which on your MBA package – and through no fault of your own – is £12.5K’s worth of productivity you’re NOT providing. In reality you’re only worth £37.5K. But the business is committed to paying £50K – so what happens to the difference? Only one answer – the business absorbs the cost. Your salary is £50K plus and that’s a given overhead – cast in bronze until the next wage review. Nor is that the only way the business is out of pocket. What about the value of all the work you do with your Key Stage One SATS capability? Way below par, the business has to kick in to compensate. At best for sub-standard work – at worst for all the mistakes, oversights and omissions you make, without ever meaning to. OK, so now it’s magic wand time. What if you never became unwell in the first place? If something stopped you from becoming sick? Some kind of prevention – to protect you and all your fellow team members. Suddenly that £12.5K isn’t money down the drain any more. Instead of turbo-charging through 9 nine months and then spluttering through 3 – you’re on after-burners for the full year. Up and going for it with the bit between your teeth, seriously delivering your money’s worth. So are your colleagues – because they’re human, they have the same 57.5 day handicap you do. But with no germs to catch and so no illness to feel, they’re delivering 12 months too. Which means if there’s 10 of them on your team, that’s £125K worth of productivity suddenly laid on the line – the equivalent of another 2¼ of you. Not exactly peanuts! So how’s it done, socking it to presenteeism – getting rid of all the germs so the problem goes away? A lot easier than you think. By upping business hygiene levels and keeping them there. We can’t see germs, so most of the time we don’t even think that they’re there. Plus, we associate germs with dirt – and if things don’t LOOK dirty, it never occurs to us that they’re there either. Which why we should never judge by appearances. Germs are always everywhere. We are constantly exposed to them – viruses, bacteria, fungi. We’re even half-bacteria ourselves. The good bacteria that colonise our bodies, handling digestion, creating proteins, even managing our immune system. Unaware of all this, we take chances. Horrific risks that would appal us if we realised. To make matters worse, by reflex habit, most of us touch our face up to 3,000 times a day. Responding to an an itch, pausing in thought, rubbing our eyes – playing with the soft tissue that is germs’ No 1 way into the body. All of which means, if you do nothing else – just putting antibacterial wipes or gel on every desk every day will bring the odds down of catching anything. Better still, it’s possible to eliminate germs from the workplace completely – by misting up the premises with germ-killing hydrogen peroxide. A quick and easy addition to the evening cleaning routine. In sterile conditions, germs can’t survive. No exposure, no illnesses to catch. Everyone’s safe – at least inside. Germ zero at the start of everyday – the only germs are the ones people bring in from outside. It is if you’re used to paying £12 an hour for cleaning and suddenly you’re sterilising the place. Depending on the size of the place, £1K a month or more. Around the same money the business loses in productivity through your existing presenteeism – and that’s just for one of you! But do the math yourself. 10 on your team losing £125K a year on productivity – against £12K a year eliminating germs and winning it all back again. That’s getting your money’s worth, surely? Yes, germs really can harm your business. Every bit as much as fire, flood or financial meltdown. They’re probably doing harm now, except you can’t see it. Just like you can’t see germs themselves. They’re too microscopically small – invisible. And the harm they do is invisible too, disguised as something else. Or so convincingly normal, the damage is not even recognised. Professional staff in place and working hard – as good as it gets, right? OK, some are on leave and some are off sick, so they’re not always at 100%. Except the rest of them probably aren’t either. They might look well and be at their desks – but don’t think you’re getting everything you pay for. Ever heard of presenteeism? Check out Russell Bowyer’s excellent In-Business Blog and prepare to be shocked. It’s when staff are at work but they’re really not up to it. Going through the motions, doing their best – but often quite literally falling down on the job. For the same reasons that they call in sick and stay home. Around a third with physical problems – aches, pains and long-term conditions. Another third with mental issues – from family crises, to financial worries to depression. And the remaining third from illness – infections and disease caused by germs. Familiar territory because we all share it. Unable to function properly because our back is killing us. Or our world is falling apart from death or divorce. Or it’s only a headache and two paracetamol should handle it. And how capable can we be, trying to do our job and feeling like that? How on the ball professional? How alert to detail? How attuned to the sensitivities of customers? Productivity goes for a loop, right? And according to a Global Corporate Challenge report (now Virgin Pulse), we’re like that for 57.5 days a year – almost three working months. Not very productive, is it? The expectation is twelve months of professional expertise. But reality is nine. And not nine smooth consecutive months either. It’s all fits and starts – intermittent performance that’s hardly reliable. A Benenden health study reveals why. Every three days or so, we do ourselves a mischief, or something happens to us that throws us off-key. Five cuts, five cramps, and six upset stomachs on average. Along with the three sore throats, four heartburns and four cricked necks – to a total of 124 ill health incidents we suffer each year. So what harm does that do to profits? Well, the CIPD’s Absence Management Report puts absence due to sickness costs at £522 per staff member per year (£834 in the public sector). With presenteeism at 10 times more, that’s a further £5,220 – together with absenteeism, a total of £5,742 per staff member per year. But don’t forget the knock-on. What kind of mistakes, omissions or oversights does that staff member make, battling with the headache, tummy cramp or laboured breathing? And what are the cost implications? On our simple cost calculator, a staff member on a modest £21,750 a year could easily trigger costs of up to £33,000 – their whole salary and half as much again. All of which is already paid out as part of the business’s regular salary bill. Invisibly siphoned away – together with the glitches more or less absorbed as a cost of doing business. Jobs take time, mistakes happen, bite the bullet. Plus of course, being ill at work brings the risk of infecting colleagues. So it’s not just one staffer, it could be a whole team. And worse, if those staff members had to interact with customers – face to face, or serving food – what are the ongoing liabilities likely to be? According to one solicitor’s website, upwards of £40,000 per customer in severe cases. So we’re up to £73,000 per staff member per year and counting – how many businesses can afford that? Then there’s the harm to prospects. The reputational risk posed by under-performing staff unwell at work. Catching a tummy bug in a restaurant could be enough to crash the business. So could one phone call to an irritable sales person on the most important deal of the year. Or the delivery driver who has a dizzy spell and skids into a shopping mall. All of which suggests it might be cheaper to pay staff to stay away than allow them to continue at work unwell. Or better still, take steps to prevent illness in the first place. Not all cases can be parried of course. The long term backache or heart condition is not going to go away. But the risk of colds, flu, norovirus, e.coli and more serious bugs can be minimised or avoided altogether by upping workplace hygiene. Antibacterial gel or wipes on every desk. The entire place sterilised with germ-killing hydrogen peroxide mist every night. No germs to catch, except the ones staffers bring in with them. Productivity protected. Profits protected. Prospects protected. No harm done – at least as far as you are able to contain it. And a lot of money to claw back if you’ve a mind to it. All from just germs. Out of sight, out of mind. Just like the money you’ve been paying out without realising. Persistent and multi-drug resistant, the new candida auris superbug is not a pandemic yet, and despite fears of its rampant onset, is not going to be. Worrying because unlike most funguses, it seems to spread from person to person – a yeast that colonises the skin and therefore transfers on contact. It’s also nosocomial, particularly present in hospitals where it targets the already ill – those patients with surgical incisions or intravenous feeds, apertures in the body that provide the way in. That makes it a real hazard to patients and health care givers – easily contaminating clothing, linen, bedrails, chairs, catheters and all kinds of surrounding equipment. A “touch it if you dare” situation requiring isolation if possible – a strain on already stretched NHS resources. To make things more difficult, candida auris is also resilient against the usual cleaning agents. Recommended is chlorine-based treatment at 1,000ppm dilution – as strong as can be risked without harming surroundings. Even so, the bug persists, frequently demanding action the hard way – repeated deep cleans and the closing down of ward and ICU facilities among the 35 hospitals affected. One of them however knows it’s got the bug beaten – showing the way for others to get themselves candida auris-free. We can’t tell which hospital it is, as all work of this nature has to be confidential. Suffice it to say though, that after two deep cleans and much worry, one particular hospital has solved the problem overnight and banished candida auris from its corridors. Misting up affected areas with ionised hydrogen peroxide – a quick and effective way to neutralise ALL germs immediately. This process does require facilities to be completely vacated – though it is possible to section off areas with protective PVC sheeting and handle the job piecemeal. Once clear, the hydrogen peroxide is released into the air, to spread in all directions and against all surfaces. The ionising forces wide dispersal and electrostatic attraction to pathogens – clamping to them like magnets and ripping them apart by oxidising them. The hospital involved made one phone call and 24 hours later the job was done – all clear and back to normal, ready for the onset of winter. No candida auris, no anything – sterilised, safe and secure. Good to know we have effective defences – especially with authorities like Forbes magazine and America’s CDC regarding candida auris as a global threat. Radiation sickness? Spies listening in? More likely germs to make you ill – invisible so we never know they’re there. Oh no, who is it? GCHQ? MI5? The CIA? A quick look at the screen and it’s more likely MRSA,SARS or DRSP. Translated, that’s Methicillin-Resistant Staphylococcus Aureus, Severe Acute Respiratory Syndrome or Drug-Resistant Streptococcus Pneumoniae. Not electronic bugs, but living microbes. Millions of bacteria, fungi and viruses (the real ones) – all trying to infect you as best they know how. And the best way is contact. Your hands touch everything. Then you eat with them, touch your face – the germs’ easy way in. Next thing you know it’s a cold or flu. Or maybe gut-wrenching norovirus, campylobacter or e.coli. Inevitably something – just check your screen. You go through the day, thinking your hands are clean, but they’re not. Which is why the finger marks. Not just traces of grease and dirt, but visible confirmation there are germs present. Your phone is bugged alright. Some germs are so tiny, it only takes 10 cells or so gathered together – and you’re infected. Norovirus, for instance, or e.coli. Or dreaded Ebola, which is smaller still – your one-way ticket to serious illness. So, germs right there, on your phone – millions of them. Any one of which could kill you if you’re careless enough. Which means when did you last clean your phone? And when did you last clean your hands? Because germs are everywhere, not just on your touchscreen. The whole place is bugged too. On the TV remote, for instance – possibly the most dangerous source of germs in your whole home. And everywhere else as well. On all surfaces. In the air. Only you don’t know they’re there because they’re invisible. Your hands don’t LOOK dirty, neither do all the things around you. So like all of us, you take chances. OK, so what if you do clean your phone – scrub it down with antibacterial wipes? And you hands too – have a go with good old soap and water, singing Happy Birthday twice like the World Health Organization recommend.? But now you can’t touch anything, because you’ll immediately get contaminated again. The whole place is bugged, remember? And even just standing there, your hands will pick up germs from the air. The surfaces you touch might not be so bad, maybe they had a once-over last night. How do you take soap and water to that? How the heck can you be safe, particularly in the workplace – where there could be hundreds of you , all touching the same things and breathing the same atmosphere? Desks, keyboards, door handles, light switches, documents, coffee mugs, money, everything? Only one way for sure. Sterilise the air and everything it touches – exactly the same tactics germs use themselves. Which means a mist-up with a germ-killer. A full-on go when everybody’s left for the evening. De-bugged, de luxe. Not with bleach or ammonia either. That stuff will asphyxiate you in two seconds flat. They take forever to work anyway – at least 30 minutes contact time to be effective. The stuff that works is hydrogen peroxide. Takes around 2 minutes to kill germs by oxidising them. Nixes the whole lot of them – bacteria, viruses, fungi, the lot. As long as it’s ionised first. That way it’s electrostatically charged so it spreads everywhere, trying to escape from itself. And the charge attracts germs like magnets – so they’re forcibly grabbed at and ripped apart by oxygen atoms. Oh, and the other thing about ionising. It turbo-charges the hydrogen peroxide mist, making it more potent. Releases a whole slew of other antimicrobials into the air as well – hydroxyl radicals, reactive oxygen species, reactive nitrogen species, ozone and ultra violet. No way any germ is coming back from that. And the whole place is now sterilised from top to bottom – all surfaces, under and behind them as well – and the air itself. Germ-free to a 6-Log Sterility Assurance Level – that’s 99.9999%, or just one cell in a million. Of course your phone could still be bugged and trying to kill you. The CIA have tabs on everybody these days – and the jury’s still out on whether cell phones generate enough radiation to be harmful. And if you’ve read Stephen King’s Cell, you’ll know you’re right to be terrified. Safer with smoke signals and carrier pigeon – as long as you keep your hands clean. How many other health protection systems keep paying your money back, over and over again? Not a system that costs, a system that PAYS – and how much better can that be? Actually, how many other health protection systems do you know about, at all? Like stop illnesses before they start? Anyway, who wants to get sick, feel like death, rush off to the doctor, get medicine and be out of circulation for a few days? Much better to avoid it altogether, don’t you think? Which is what health protection is all about. And to blow our own trumpet, we think the one we’re associated with is the best in the world. Because it works, is why. It gets rid of harmful germs – even when clean-up teams have had go after go at doing it already – deep clean with bleach, steam, the lot. Kinda important when it comes to keeping your workplace safe. Keeping staff healthy and at full performance levels – bright, alert, going for it and enjoying their jobs. Which doesn’t happen if they’re off sick. And gets even worse if they insist on toughing it out and coming to work anyway. Check our calculator. Because who can concentrate when their bodies are giving them grief? Pounding head, runny nose, twisting gut ache – just getting through the day is a challenge, let alone getting any work done. There’s the quality of that work, too. How good is it? How mistake-free? How on-time? Is the customer feelgood still there, or has irritability from feeling unwell given them the brush off? You wouldn’t hire dummies to work for you. But that’s often reality when staff try to cut it when they’re not up to it. It’s not their fault, of course – they’re ill. They should be safely out of it, resting up and getting better. Instead of which, they’re doing you no favours, blundering around like a loose cannon – unintentionally doing what kind of damage? Could cost a bomb, right? Thousands and thousands and thousands. Especially if you lose a deal, or get hit for negligence, or miss out money-making opportunities. None of which happens with a health protection system in place. And we mean health protection, not wellness programmes. Actively intervening to stop illnesses happening – not bribing staff to perform with gym membership, medical consultations, feng sui décor and fresh fruit in reception. And like we said, we think the health protection system we’re associated with is the best in the world. Because it gets rid of ALL germs in the workplace. Makes the place sterile in around 40 minutes. No germs to catch, no illnesses to come down with. Simples. It’s easy to see why too. The system we’re on about tackles the air as well as surfaces. And if you think about it, air is around 80% of any room space. Yet most cleaning and disinfecting processes only focus on surfaces. Clean the floors, wipe down the walls, scrub the surfaces – that’s yer lot, mate. Plus, to kill germs, whatever disinfectant is being used has to make minimum contact time to be effective. Not exactly achieved with a wipe-on, wipe-off rag. And anyway, bleach needs around 30 minutes to kill germs. At full concentration too – not diluted to a weakened version because people can’t stand the smell. Then there’s making sure the stuff gets everywhere – because that’s where the germs are. Microscopically small and light, they can float anywhere and lodge deep in cracks – untouchable with normal methods. Ah, but the system we’re on about is not normal. Misting up the air is not normal, but that’s how this particular health protection system works. Like germs it floats anywhere, including deep into cracks. Because it’s forced to, is why. First off, it works with hydrogen peroxide – the same stuff our own bodies produce to fight infection. Sprayed out as mist, it’s ionised at the last second, charging each of its particles electrostatically. Which is how they’re forced into all cracks and crevices – exactly where germs escape from normal disinfecting. And those germs’ worst nightmare is just beginning, because ionising supercharges the hydrogen peroxide particles to make them more powerful. And the electrostatic charge yanks germs towards them like a magnet. It’s a death-clutch with no escape – the stuff takes just two minutes to oxidise germs to nothing. Cell walls ripped apart by oxygen atoms, a one-way ticket to oblivion. Like we said – no germs, the place is sterile. And the system does all this for around £3.40 an average-sized room . Push button easy. A few hundred a month to keep all germs at bay. Slightly better than the few thousands a month most businesses are unwittingly writing off to staff unwell at work. They are, you know. But hopefully that doesn’t include you. Because that’s what being unwell at work does. The usual sign is that productivity is not as good as it should be. That jobs take longer and everything is wheel-spin without knowing why. Hard to understand when you know your team are all hand-picked professionals. What’s wrong with them? They’re not well is what – but they’re struggling to support you . Meanwhile you carry on, wondering why it’s so expensive to get anything done. Not easy when for 57.5 days a year – almost three working months – staff are not themselves for some reason or another. So you write it all off – or more likely, assign it elsewhere – a cost of doing business. Money down the tubes, but what can you do? Get an effective health protection system is what. And start getting some of that money back. Because if everybody’s happy, healthy and well, productivity is on the up. You might even be looking to pay bonuses.